What is Fords Hospital now used for and why was the part of the building not damaged by the bomb knocked down? Hi Vicky, First the good news.... Ford's Hospital is still used for its original purpose, which is as a home for elderly folk. 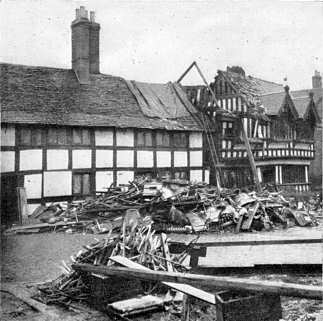 If the undamaged part to which you refer is in the photo below, then that wasn't actually part of Ford's, and I believe that it was knocked down to allow the building of the old Postal Sorting Office, which used to stand before the Salt Lane car park took its place. I might be wrong however, and someone like 'Dutchman' may be able to add more about that. It's quite a shame though, because that old cottage plus the restored Ford's Hospital would've made a super old pairing. Rob Orland said: ...I believe that it was knocked down to allow the building of the old Postal Sorting Office, which used to stand before the Salt Lane car park took its place. The sorting office was built long before the war so unless an extension was added to it later I don't think it had any impact on the cottage immediately next to the hospital which survived the war? Thanks for that dutchman. I've never seen any information about the sorting office, so for some reason I'd assumed that it was a post-war building completely at the expense of the cottage. Further to my above posting I've found this postcard of mine, undated but possibly from the 1960s, so I've included a cropped image showing the relevant part. The angle is deceptive, so I can't quite make up my mind whether there was room for the cottage between the sorting office and Ford's. If there wasn't room for it, then maybe the cottage did have to give way for an extension? The right hand end of the sorting office does look feasibly like an add-on. Thanks for that Cliff - you've sorted this one now! And what a smashing postcard too, which perfectly illustrates the way the cottages fitted in between. Now I've seen your card I can see that the outline is indeed slightly visible on my poor quality image. Although the angle makes it difficult to tell, do you think there could be a narrow alley between the garden wall and the sorting office? It still looks like the newly build garden wall wasn't quite as long as the cottages were wide, especially when looking again at the small war-damage photo above. Incidentally, does anyone know when the sorting office was demolished? That's a great photo, very clear, and nice that it shows more of the street too, rather than only a close up. Ford's is a notoriously difficult building to get a good photo of actually, because of all the higher buildings across the street and the trees, which cast the frontage in deep shadow for most of the day. Did any of you manage to get an inside look during Heritage Weekend two weeks ago? It was the first time it's been opened up to the public for one of these weekends, and I'm so glad we went. What a fantastic place, full of character - and characters! I even asked the folk inside how they were treated when David Tennant and Co. 'kicked them out' for the making of Doctor Who back in 2006, and apparently they were treated very well.... the BBC offered them a hotel and meal, and the six of them ran up a bill for 1,200 quid!!! Glad to hear that our licence money isn't completely wasted! A lovely 1920 shot up Greyfriars Lane. Two very pretty shots Prof. I'm more used to seeing in black and white or paint. Neil, good one. I've seen several of the that building on the right looking the other way but this is the first from that direction. The majority move forward and miss it altogether. Neil, it's not until you see these old and priceless photos that you realise the true extent of war damage caused to the city. The new generations since wouldn't have a clue or have seen Coventry of old, and thanks to you and other members on HC, and Rob for making it possible, who seem to come up with all this photogenic history it's now there for us all to see.